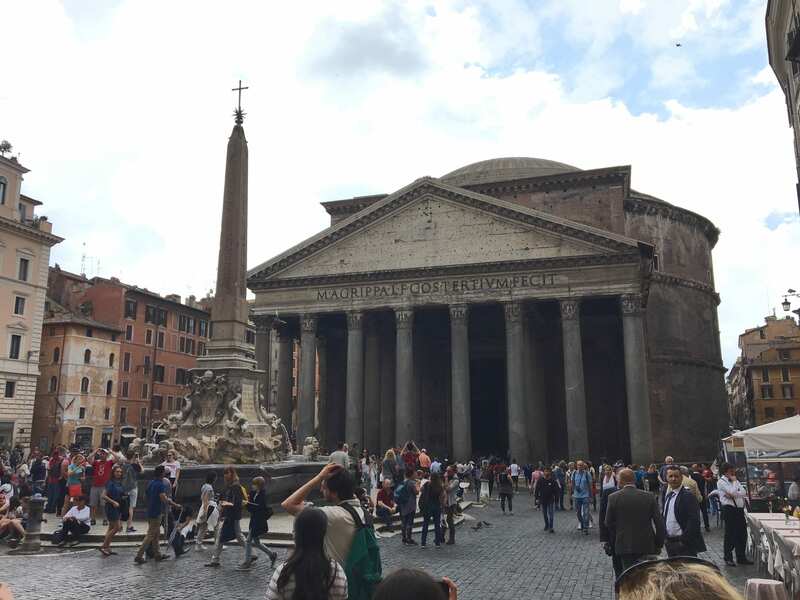 This is the nineth in a series of blog posts from Whitties studying on Whitman’s Crossroads: Rome, Italy: Landscape and Cityscape in Ancient Rome program this summer with Professor Kate Shea. Juan Pablo Liendo Molina ’21 is a Politics-Environmental Studies major. 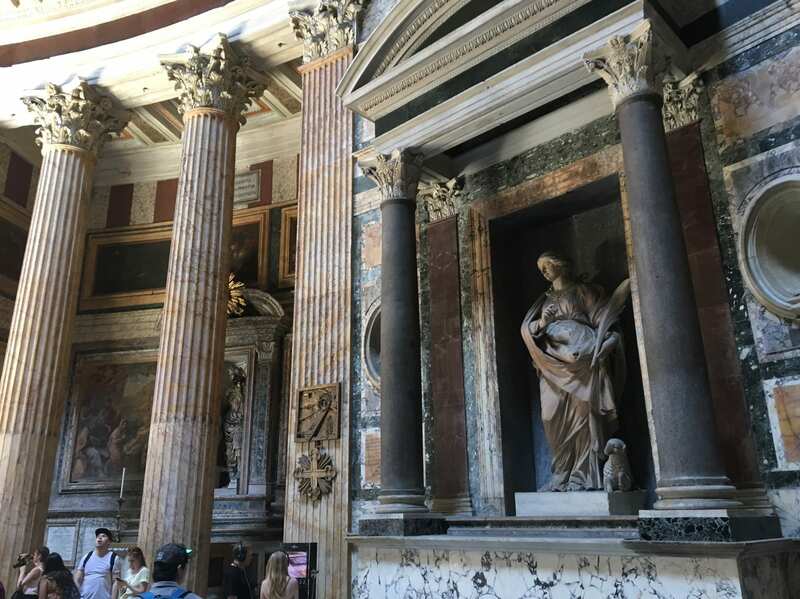 For this post, I wanted to talk about one of my highlights of the Crossroads Rome 2018, and what I consider a turning point in our group in terms of dynamics and the relationships among each other. This post is about our visit to the Park of Aqueduct, an experience filled with challenges and surprises for everyone in the group. 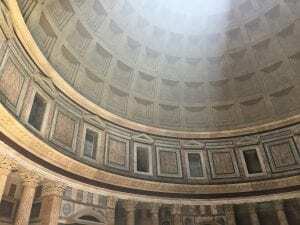 Visiting Rome has been an eye-opening and unique experience in terms of allowing me expand my understanding of the roots of modern engineering. Romans mastered the construction of large structures together with a purpose of making them functional and useful for their citizens. They addressed social needs in an aesthetical way, so the human intervention would merge with the environment instead of disrupting it. These practices make me believe that Romans managed to create an early concept of sustainability and environmental awareness back then. I would even say that Roman construction practices still have an important influence in our modern understanding of engineering. Furthermore, the one type of construction that made me fully understand the Roman modern influence were the Aqueducts. 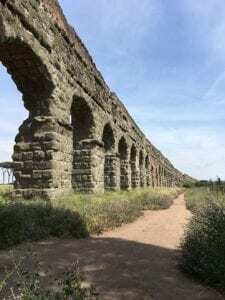 Visiting the Aqueducts was an adventure for the whole group. Such journey started with a bike ride to the mountains, which in a short time turned into a marathon for many of us as struggles showed up in the way. The challenges started as few members of the group were not confident at bike riding, then heat of the sun got increasingly stronger, and finally we got lost a couple of times. All these factors led to physical and mental tiredness. As a group, we got to see a new side of everyone’s personalities and how to collaborate with the other. However, once we arrived the place, the whole experience changed, the landscape left people speechless and restored their energies back to normal. On a personal level, once we were at the place, I suddenly found myself next to my bike standing on an immense flat field which was dominated by the presence of nature and a gigantic wall of rocks. Then, several thoughts came to my mind: On a first sight, I thought of the aqueducts as a division of the field in two sides, a disruption of the natural landscape. However, when I looked at it on detail, I noticed that rather than a division, the wall was part of the landscape. Its structure composed by arches was outstanding, it connected both sides of the field, and its rocky structure allowed nature to grow around it in a harmonic relationship. Its aesthetics didn’t disrupt the landscape, but rather integrated to it while doing its function. It was amusing that such visually appealing structure in the middle of the fields also had a vital function for the whole Rome, which was to provide them with water. 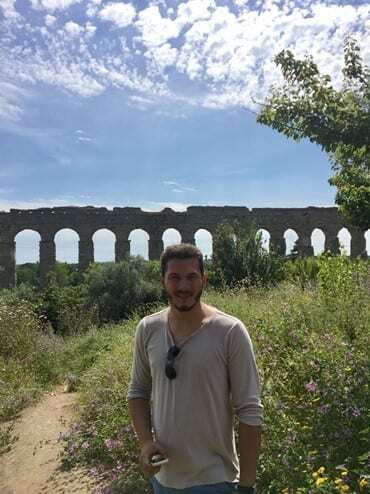 Standing in front of the aqueducts was a journey across time, it meant traveling two thousand years to the past in just a second. Connecting the past and the future in the same place demonstrated to me the possibility of humans interacting with the environment and constructing long-lasting and useful structures while having a positive effect by making them part of the landscape. It helped me connect the dots and see the catharsis between functionality, aesthetics and interactions with nature. 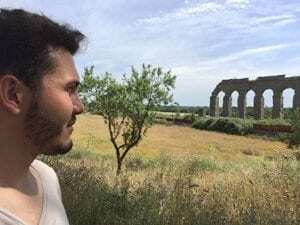 As an Environmental Studies-Politics student, Rome taught me that Politics have an immense will in the citizen’s life-quality and the sustainable development of society and natural spaces. Looking back at the day, this experience taught me even more than just academics. It also taught me a lot about group dynamics and effort. Everyone’s personal challenges on the way to the aqueducts changed the overall mood of the group and affected each other’s experience. This situation left the group with two options, either to give up and let everyone be moody, or support each other on their struggle and push the whole group to its ultimate goal. By collaborating with the other and supporting each other, we made it to the place and got to enjoy the magnificence of the landscape. The way how our team achieved its goal gave me a new way of understanding the Aqueducts, their structure and age. It made me understand that they are indestructible not because their big size, but because they were built by a team of people who pushed the other to the ultimate goal. It made me think in how often we easily give up in daily challenges without even trying, and in contrast how supporting each other got us that far. This experience translated to me to how real life works, and in the saying of how as separate individuals we will achieve things faster, but as a team we can go further with each other’s support. It made me think that this can reflect in our modern society and our ability to achieve a change in society. This entry was posted in Uncategorized on August 20, 2018 by serranvj. 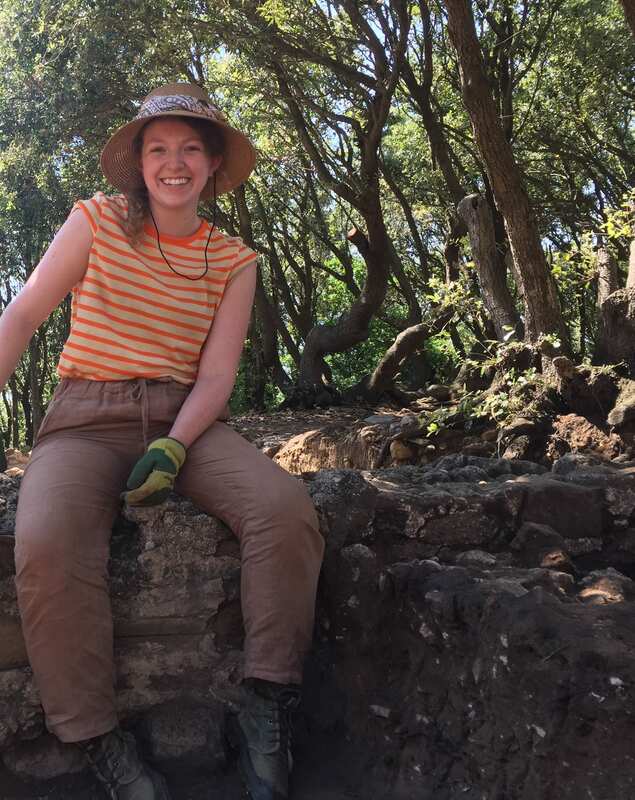 This is the eighth in a series of blog posts from Whitties studying on Whitman’s Crossroads: Rome, Italy: Landscape and Cityscape in Ancient Rome program this summer with Professor Kate Shea. Emily Chargin ’21 is undecided. 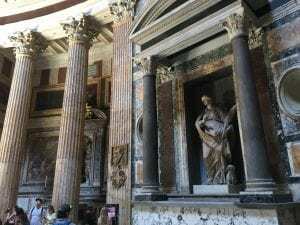 The first time our group visited the Pantheon was on our first day in Rome. It was part of a preliminary tour of the city that, though full of interesting sights, was also overwhelming and hard to appreciate with jet-lagged minds. We had left Seattle nearly 36 hours before, and I was more overwhelmed by the sheer size of the foreign city than by any history I knew I should be appreciating. Then our group turned a corner in a residential area and saw not only the throngs of tourists and the vendors that were already becoming an accustomed sight, but the Pantheon itself. This was, without any warning, a genuine icon of Rome; there was no image on a computer screen or instruction to imagine what once was. I was in front of it. And then inside it. At that point, I, along with much of the group, had very little idea what the building was – Vittorio Emmanuel was only a king in a tomb, Agrippa was a vaguely recognized name on the front of the building. But I was still undeniably in Rome, and it was beautifully preserved. I am not religious, but between the modern church itself and the sheer history of the building, the atmosphere was undeniably spiritual in a way that was foreign to me. I didn’t want to leave. When we visited again two weeks later, I knew more and was less dazed by the building’s existence. The presence of the marble and art was marred by the knowledge that they should have been present on so many of the now-bare sites we visited. The transformation into a Christian church, though it allowed the building to survive, seemed an unjust intrusion. Every immaculate Christian statue and painting was a reminder of an unknown statue that had once stood in its place and was now destroyed. There was a slight bitterness in my appreciation. This trip was also more academic: we knew more of the building’s history, and spent most of our time listening to an audio tour of the various historic and artistic features rather than simply admiring the building. The structure now seemed less isolated than it had when we first stumbled upon it, as I knew where to place it in history and in relation to other monuments. It wasn’t actually so far from other monuments Augustus had built in the flood zone, nor was it far from the part of the city I knew. Furthermore, our lessons had made the building’s very survival even more impressive. A dome larger than in Saint Peter’s Basilica, built with ancient technology and materials, had outlived grounded and massive structures that had been built to last, such as the Circus Maximus. Walls covered with marble and gold had been preserved through centuries of looting. And hundreds of buildings of similar grandeur would have existed in the city at the height of the Roman Empire. These accomplishments remained just as striking after I had seen so much more of the city in ruins as the first time we wandered through the doors. 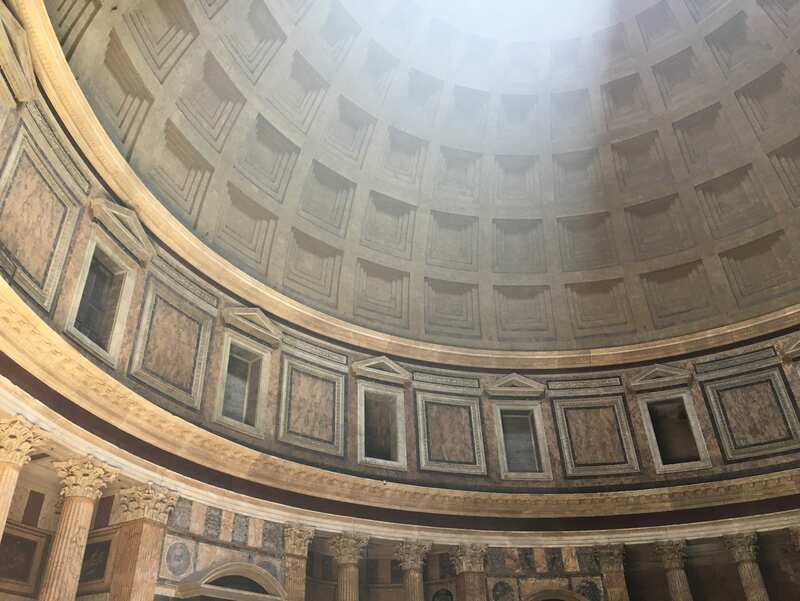 The Pantheon remained a welcome reference point for the rest of the course, and no amount of historical context removed the pure spectacle of the interior. 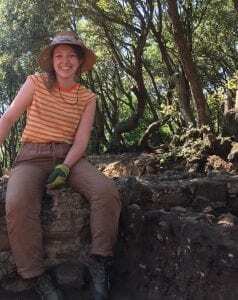 This is the seventh in a series of blog posts from Whitties studying on Whitman’s Crossroads: Rome, Italy: Landscape and Cityscape in Ancient Rome program this summer with Professor Kate Shea. Laura Jessich ’20 is an Art, Art History & Visual Culture Studies major. When I see ancient roman pottery in a museum I think about gloved hands and quiet voices, noses in books and careful dusting. But these ideas came to an abrupt halt for the last portion of the trip. 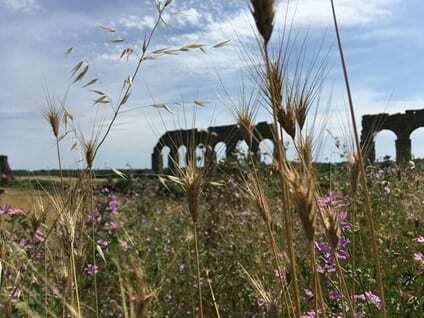 After walking 8-13 miles a day in Rome we were all pretty grateful to be heading to the country side and the beach. We ended up savoring those precious r&r moments more than I expected. We were met in Populonia by our lead archaeologist, Carolina, your typical Italian boss-woman, dressed entirely from head to toe in hot pink. After securing us food and shelter Carolina set out to fulfill our next rung on Maslows’s ladder: dirt. So much dirt. We spent the next week sweeping dirt, troweling dirt, digging dirt, collecting dirt, examining, carrying, dumping, heaving, breathing dirt. 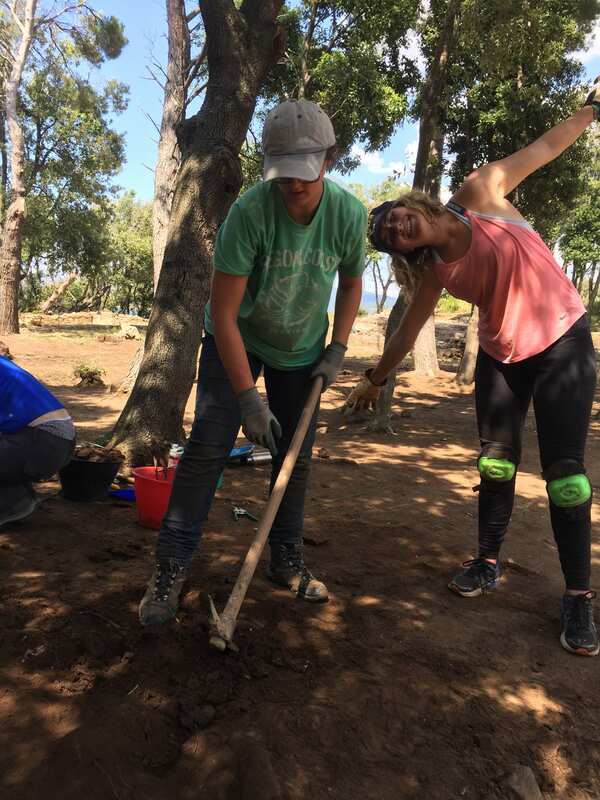 At the end of our 8 days our discoveries were totaled at a handful of green roman glass, some pieces of amphora’s are other varies kitchen ware, a brass hook, a plastic army man, and 100+ roof tiles. Archaeology is way different than I thought, and honestly it mostly consists of cleaning. Our team of 18 people spent the first two days cleaning an area the size of a couple dorm rooms. 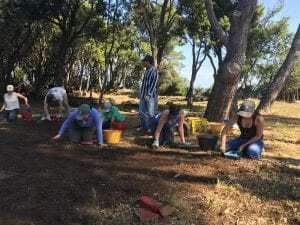 Before we could start excavation we had to clear all the leaves, pull grass, cut roots, and collect rocks until our site was just plain brown soil. Then we finally started excavating. Think of the most inefficient way you could remove dirt from pile and there you have archaeology. Like having to mow your lawn with only scissors, we scraped away dirt layer by layer. 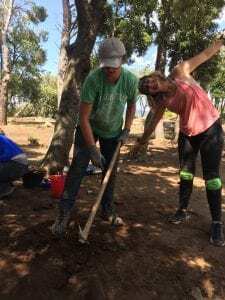 Under the constant watch of Carolina and her other three amazing archaeologist we learned how to carefully uncover the fallen history of our villa. We were so lucky to learn from such talented, passionate, and unique people. Not to mention our site was by far the most pleasant of all we visited. Perched on the edge of Baratti Bay, we caught the ocean breeze in a wooded area that stretch up the coast. The Villa of Poggio del Molino has an incredible complicated and overlapping history. It was first a fortress after the Punic wars that produced iron. After the Augustan era in 27AD construction began that transformed the building into an agricultural villa. It was used to produce fish sauce, an expensive delicacy for the ancient Romans. In its last phase it became a maritime villa with a full roman bath. This time is characterized by beautiful mosaics. The most remarkable of which depicts Medusa, but it had to be recovered due to fear vandalism. 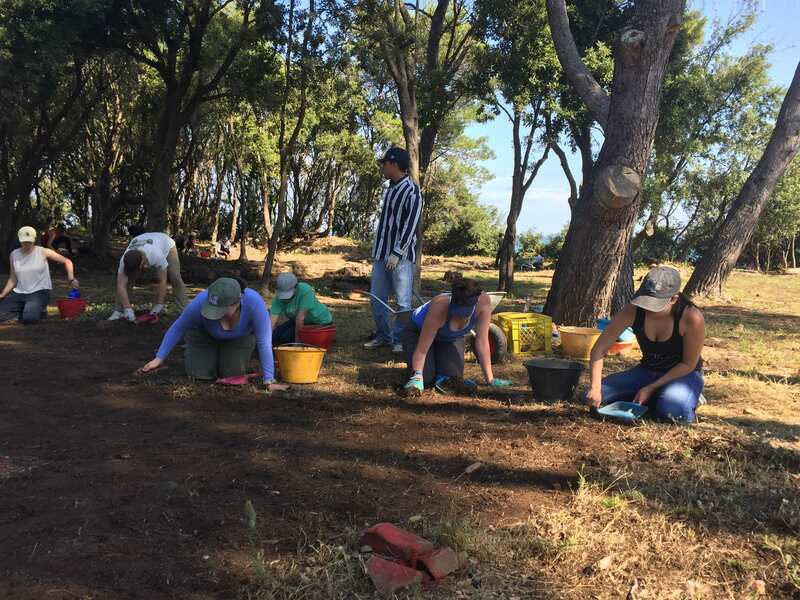 Carolina’s mission is to change the way the community interacts with and views archaeology. The opportunity for us to work at this site was due to her decade of efforts to involve volunteers from all over the world in uncovering this keyhole into history. Usually digs are dominated by universities and inaccessible to the public, but Carolina seeks to change that approach and make it known that sites like these are part of everyone’s history. This entry was posted in Uncategorized on August 9, 2018 by serranvj.